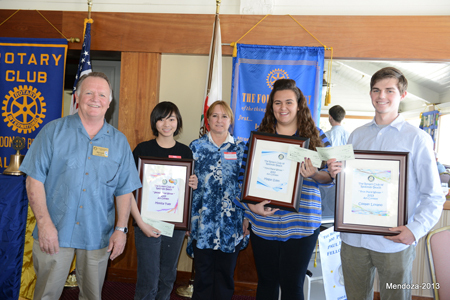 (REDONDO BEACH) April 17, 2013 –Visitors, announcements, art contest winners, and a look at the library system in Redondo Beach. Oh, and we inducted a new member. It was a busy weekly luncheon. Scott was not only a visitor. We inducted him today into the club. He was inducted by PDF Eli Gauna, himself also a new member of our club. April 18-21: Springfest in North Redondo. See Jim Chen. April 19: Go-Kart racing for the annual Grand Prix prize. See Scott Fellows. April 24th: The Salvation Army is hosting a shoe drive. See Galina Gilman. April 27th: Our club sponsors 30 need kids in the community and we are buying new shoes for them from Payless Shoe Store in the Galleria. Nancy announced that we need helpers from 8 to 10 a.m. on April 27th. See Marcello Goncalves if you are interested. May 2-5: District 5280 annual conference at the Fess Parker Ranch in Santa Barbara. Click HERE to learn more about this exciting event. May 9: The Club will join with the Molina Foundation to deliver books to Fry Elementary in Wilmington. See Terry Bichlmeier. May 18: District Assembly at the Carson Center in Carson. All board members for the 2013-14 year are encouraged to attend. May 19th: There will be a fundraiser at the Campbell’s home for the club’s Community Foundation. Wine tasting, potluck, bingo and more! It is scheduled from 4-6 pm. Nancy encouraged everyone to bring a check in the amount of $25.00 or more made out to the Rotary Club of Redondo Beach Community Foundation. Art Contest: Bill Gard announced the winners of our annual Art Contest: They are all students at Redondo Union High School, said Debbie Smith, their art teacher. The winners, including the cash awards they received are Cooper Lovano, 1st place, $300.00; Monica Tuey, 2nd place, $200.00; and Megan Eden, 3rd place, $100.00. Congratulations to all. Luncheon Speaker: Jean Scully, a member of our club who is currently serving as secretary, gave a comprehensive and delightfully humorous presentation about the path that led her to her current position in Redondo Beach, and the library system here in Redondo Beach where she serves as Library Director. Jean said she went back to work after sixteen years not employed outside the home and worked her way up from the ground floor –literally— shuffling library books back onto the proper shelf. She worked full time while studying for her Master’s Degree and became Head of Technical Services upon completion of the degree. She then did a start-up for a library automation consortium. Her first position in California was Assistant County Librarian for the County of San Luis Obispo where she became a Rotary member. When she landed a job in Redondo Beach, she started on a Tuesday and attended a Redondo Beach Rotary Club meeting the next day. “The City of Redondo Beach has two libraries in beautiful buildings,” she said. “We occupy the main branch adjacent to the city hall and a branch in North Redondo Beach. We have a full-time staff of 18 plus a number of volunteers. Scully gave a statistical picture of library use in Redondo Beach: 59% of the residents of Redondo Beach have library cards, 933,939 items were checked our last year, there were 455,030 visits to the two Redondo Beach libraries last year, 61,800 public computer sessions, and 50,00 reference questions.